Over the past few months I’ve discovered Jasper Fforde. While my leisure reading tends toward heavier material, Fforde has an amazing sense of wit that makes his writing nearly irresistible. 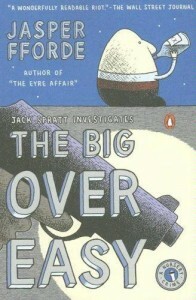 I recently read The Big Over Easy, a gritty detective novel about the case of Humpty Dumpty. Throughout the story nursery rhymes are presented in literal and improbable ways, juxtaposed with the daily life of a down-on-his-luck cop. The reason that I mention the book on this blog, however, has to do with the character of Prometheus (some mythological characters also make their way into the story). Having taught Classical Mythology over the past two years, I’ve had occasion to read quite a bit about Prometheus. He is one of the more intriguing mythological characters posited by the Greeks. The creator of humans, Prometheus has a soft spot for our development that angers the other gods, jealous as they are of their privileged places. In The Big Over Easy, Prometheus is explaining to the protagonist and his family why he thought it was worth having his liver pecked out daily in order to give humanity fire. He then tells them that he also gave people the fear of death. When asked why, he declares that the fear of death makes mortals appreciate life. There are the negative side effects such as war, hate, and intolerance, but Prometheus maintains, “I’ve seen the alternative. Eternal slavery under the gods.” Greek creation myths leave no doubt on this point; people were created to serve the gods. If we challenge that decree that we simply inherited, we are guilty of hubris, stepping over that line that separates them from us. Gods appreciate no such challenges. It is ironic that nations based on the ideal of freedom so readily bind themselves to the strictures of the divine. The latest aggressions in which our nation has involved itself purported to be in the cause of “liberty,” “freedom,” and “democracy.” These sentiments were uttered by politicians who believe such principles ought to be bound by archaic instructions handed down through a mythological lawgiver. Our freedom ought to be circumscribed by mythology. The irony is so thick here that it is difficult to believe anyone can take such rhetoric seriously. Perhaps Prometheus brought us fire in vain. Not to worry, however. Jasper Fforde is an author of fiction only, and the arbitrary storms of Zeus no longer strike us when the gods are angry. Unless, of course, you have forgotten Hurricane Irene. Old myths never die, and, like bad eggs, once encountered they are not easily forgotten. I sometimes jog in the morning before the sun begins his course across the sky. Funny thing is, sometimes I beat him. I know the sun is a guy because the Bible says so. When I startle a bunny from its hiding place along my path, I am amazed that those little creatures chew the cud just like bovines. It is the word of God. Occasionally a suicidal insect tries to fly into my mouth, and unless they go about on all fours, with legs above their feet, I spit them back out. If they do meet Leviticus 11’s strict standards and I accidentally swallow, I try not to think of Deuteronomy 14.19. I am surprised that the Tea Partiers haven’t tried to correct science on this point: the Bible is clear that insects (technically “flying creeping things”) have four legs, not six. Open your eyes people! Six legs? All those sixes seem to be from the antichrist. That’s why I feel comfortable with the potential of handing our nation over to the Tea Party. Certainty is better than scientific orthodoxy, hands down. “I don’t know how much God has to do to get the attention of the politicians. We’ve had an earthquake; we’ve had a hurricane. He said, ‘Are you going to start listening to me here?’” The words are those of Michele Bachmann. Those of us who were taught that hurricanes result from the heating of Atlantic waters, swirled by the rotation of the earth (it does not move, according to the only proven source of science, the Bible) have egg on our faces. Do I ever feel silly! Empirical evidence suggests that the earth’s crust consists of tectonic plates that sometimes bump and rub and pull apart. Earthquakes result. Last week’s earthquake creates a problem for me, however, since North America is not mentioned in the Bible. I now live in a country that can’t possibly exist. We had better elect leaders who know how all this really works. According to a Religion News Service poll this year, 40 percent (that’s more than half, in Tea Party mathematics) of Americans believe natural disasters are signs from God. I am relieved that this clearly shows science to be wrong—surely that many individuals must be correct. That’s the way math works. 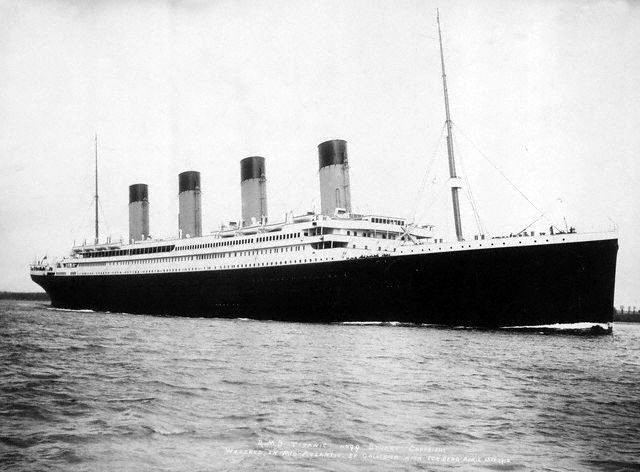 I sometimes imagine the United States as the Titanic (movies are another good source of science). Ismay, the Tea Party, declares, “But this ship can’t sink!” Thomas Andrews, the engineer (representing science) replies, “She’s made of iron, sir! I assure you, she can… and she will. It is a mathematical certainty.” Ismay, believing the rich are too wealthy to die tragically, refutes the findings of science. When the colossal ship slips into the icy Atlantic, however, he’s nowhere on board. Like the rest of his party, he’s already secured himself one of the rare seats on the lifeboats inadequate to save those of us in steerage. Since the ship can’t sink anyway, why are we even worried about this? A delightfully witty book review appeared in yesterday’s newspaper introducing Penn Jillette’s book God, No! Signs You May Already Be an Atheist and Other Magical Tales. Having just learned of the book I’ve not yet read it, but I am intrigued. Penn Jillette is best known as the talking portion of the magic-debunking duo Penn and Teller. Having forged a career of exposing false claims to the supernatural mystique of stage magic, Penn and Teller delight in bucking the orthodoxy of the guild and showing that anyone clever enough can fool many people into believing what they know can’t be true. They are exploiting, of course, a phenomenon that neuroscientists have been exploring for a number of years: human brains retain belief even in the face of disproving evidence. 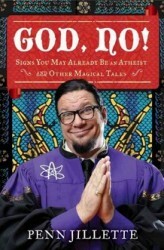 Many religious believers call it “faith.” According to Hank Gallo, author of the review, Jillette uses his book to endorse atheism as the only real option for a thinking person. The book is generally categorized as humor. Although Bill Maher’s Religulous makes many good points from a similar perspective, one of the haunting realities poised for religious specialists is almost a chiaroscuro with excessive contrast. It takes no special training to be a religious specialist. That is hard news to hear for those of us who’ve spent over a decade of our lives and thousands of dollars learning the trade. Comedians and others who are famous will impact far more people than this little blog ever will. Rick Perry can call together thousands to pray to pave his way to the White House. Maher and Jillette can poke fun at religious yokels and scholars will sit at their desks ignoring the crude efforts of those who have no training. There is no doubt, however, as to which will reach a wider audience. 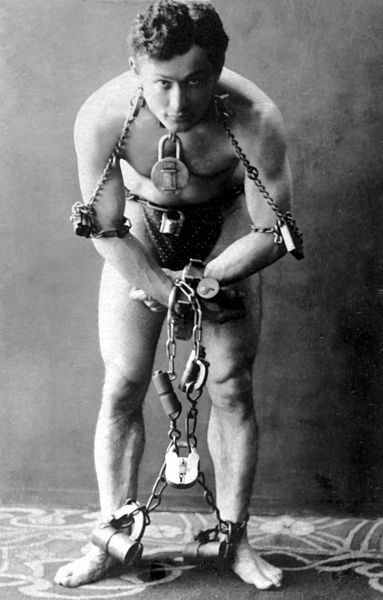 Harry Houdini famously debunked spiritualists in his day. Like Penn and Teller, he was a stage magician who recognized that people could be easily fooled. He was able to expose mediums that scientists and academics of his day failed to uncover. It seems that those with access to the most basic of human desires—the will to believe—gain credibility more readily than an erudite yet obtuse specialist with several odd initials after his or her name and several obscure books to his or her credit. Those in the media have direct access to the mind of the public. If the tent is big enough the whole town will show up for the circus. The truth may be out there, but the minds of the public are won over by those who entertain, not those who bury themselves in dusty tomes and seldom see the light of day. 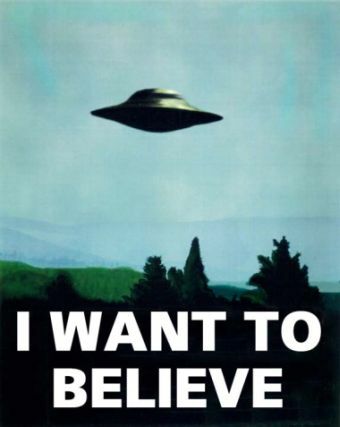 The fact is people want to believe. Until a better alternative is offered, we might prepare ourselves for a long round of Texas Hold’em and a Tea Party or two. Last night as we said goodnight to Irene, my family decided to watch The Day After Tomorrow. Beyond The Perfect Storm and Twister we didn’t have any other weather-related disaster movies on hand. I became convinced long ago that weather was somehow key in the conception of divinity. Working at a seminary that required attendance at chapel twice daily where we would lugubriously and laboriously recite every verse of every Psalm according to the unforgiving schedule of the Book of Common Prayer, I began to notice the weather. Among the more common images used in the “hymnal of the second temple,” weather was seen as an essential aspect of divinity. Religions with celestial orientations frequently view the sky with a sacred aura. I began to compile all the Psalm references to the weather and eventually brought them together into a book, still unpublished. What became clear at the end of this exercise was that ancient people had no way to interpret the weather other than as a divine phenomenon. Listening to all the hype about Irene, it still seems to be the case. In The Day After Tomorrow, our ill-fated teenagers are trapped in the New York Public Library as a super-chilled tropospheric wind freezes New York City. They build a fire and when you’re in a library, naturally, you burn books. I kept looking at all the furniture they spared as they consigned the books to the flame. A minor character called Jeremy is shown clutching a Bible. A girl named Elsa asks if he thinks God will save him. Replying that he is an atheist, Jeremy says that this is a Gutenberg Bible, “This Bible is the first book ever printed. It represents the dawn of the Age of Reason. As far as I’m concerned, the written word is mankind’s greatest achievement. You can laugh, but if Western Civilization is finished I’m gonna save at least one little piece of it.” This little dialogue represents the full circle of the celestial god. Jeremy doesn’t believe in this god, and the Bible requires human protection. Instead of being the instrument of war and political badgering and tea parties, it is seen as a symbol of enlightenment. It represents the first steps toward reason. As Hurricane Irene still gusts outside my window, dropping rain as if New Jersey were a desert receiving its first drink in a century, the Tea Party is busy crafting ways of getting the Bible back in the White House. Their Bible is the antithesis to the Age of Reason. It is the symbol of superstition and prejudice and authoritarianism. It is the means of political power. The god of the Tea Party is a white-bearded man living in the sky, sending his fury against the liberal cities of the East Coast in a mighty wind. He is the punishing god of the Psalms. As the helicopter lifts off over a frozen Manhattan, the teenagers saved by a flawed father who walked from Philadelphia to New York to find his son, the camera pans across Jeremy as he hugs the Bible to his chest. I was in Boston for Hurricane Gloria back in 1985. Watching the waves crash on the beach at Winthrop I felt the power of fierce nature at the beginning of my own journey to, I hope, enlightenment. When it was over, however, there was not yet a Tea Party threatening an even worse, unnatural disaster to follow. 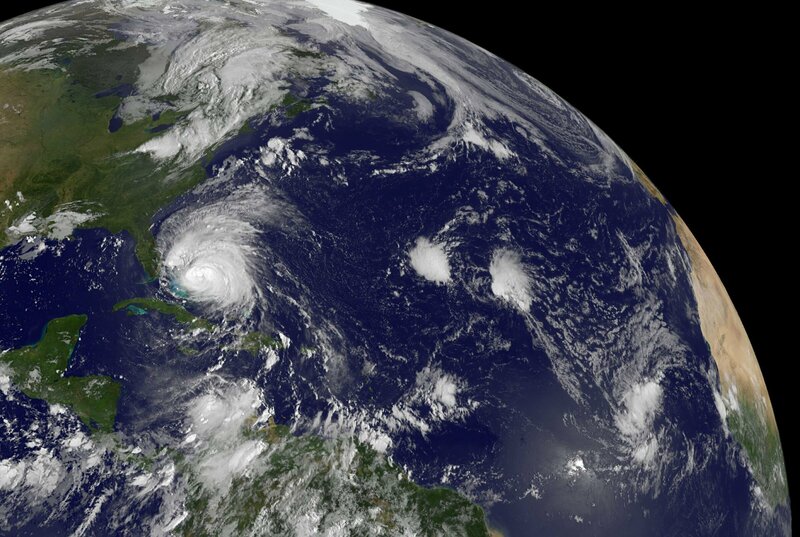 All the build-up for Hurricane Irene masks a deep-seated fear of the uncontrolled. If the storm devastates anyone, there will be Biblicists who say, like Job’s friends, that they must have sinned. Such pronouncements accompany nearly every natural disaster, as if God is huddled over the globe attempting to concoct more horrid and sinister ways to punish sinners. Natural disasters, however, have a way of effecting good and bad alike, just as the benevolent sunrise and the soft kiss of the rain (both according to someone mentioned in the Bible as being the son of someone important). But when danger looks down its barrel at human communities, they don’t neatly divide into sheep and goats. All people are a mix of virtuous and vice-ridden in varying ratios, and only the God of the Marquis de Sade would slam the iron maiden shut on all alike. The East Coast saw this earlier in the week when a benign earthquake shook our world. Barely had the ground stopped trembling before we were informed it was divine punishment. For what, no one could really say. Interpreting nature according to the Bible is so misguided that it is difficult to know where to begin the critique. Yes, some biblical writers with a flare for the dramatic will claim that Yahweh was behind some disaster. Of course, they had no concept of science, in this case, meteorology, upon which to draw. Nature acts in unexpected ways because God has his fingers in the bowl. Even the early church gave up on that way of interpreting things as soon as natural processes could substitute for God. When religion because politicized, however, we started to see a backlash of backward thinking. It is a simple enough deception to utilize. People fear natural disasters, and the politically savvy know that few have any theological training. You can very easily encourage panicked masses to follow you if you claim to have read the Bible. From years of teaching it, I can certainly affirm that many clergy have not read the whole thing. Yet we use it as the barometer of divine wrath. I, for one, am not worried about Hurricane Irene. As New Jersey has zigzagged in and out of the predicted track of the storm, it seems as though God may be wavering. If it misses the politically astute will say it is Chris Christies’ righteous policies of helping the wealthy at the expense of the poor. If it hits they will claim it is the sinfulness of the liberal camp that led the winds this way. It is all wind. Having written a book-length manuscript on weather in the Psalms, I know a fair bit about biblical perceptions of weather in the world of ancient Israel. 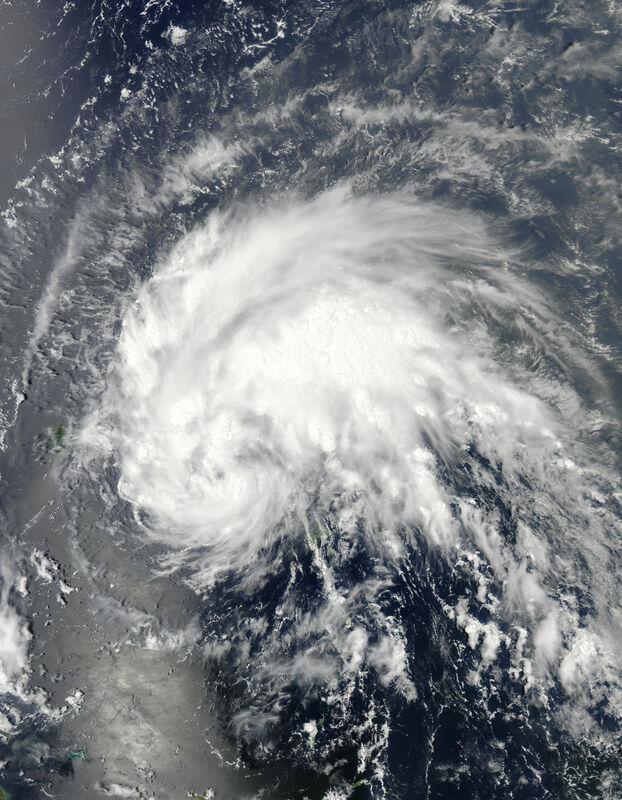 Although over-zealous translators ill-informed about meteorology used to translate a word or two as “hurricane” the fact is that biblical Hebrew has no such word. Due to the rotational direction of the planet (about which they also did not know) hurricanes never hit Israel. Herein lies the basis of my confidence in the face of Irene. If the Bible doesn’t mention hurricanes, they can’t possibly exist. Literalists up and down the coast should heave a sigh of relief. But just in case, I have stockpiled several gallons of water, right next to my Bible. Good morning, Irene -- if that is your real name. Once in a very great while I find a book that I simply can’t put down. It is a rare windfall when that book feels like it was written especially for me. 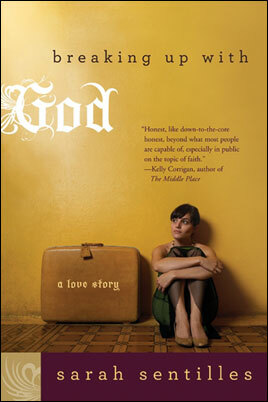 I was instantly engrossed in Sarah Sentilles’ Breaking Up With God. Like Susan Campbell’s Dating Jesus, this book reinforced the fact that women experience a side of God’s character generally closed to men—the idea that God might be a lover. In our distorted, still patriarchal culture we have yet to grow beyond the idea that God is male. This simple, persistent teaching ensures that a gender-divide will always remain in effect when it comes to monotheistic religions. What truly spoke to me from Sentilles’ book, however, was not the theology, but the heart. Although the gender view from which I approach concepts of divinity must necessarily be different, here I found someone with a journey in many ways similar to mine. The honesty with which the author lays open her experience is beautiful and terrifying. One of the recurring questions on this blog is whence the concept of God arose. Anthropologists, psychologists, and theologians come up with varying answers but the fact is the real impact is felt in very human minds. We have, perhaps unwittingly, devised a punishing image of the creator of the universe. A God who causes, allows, or at least condones arbitrary human suffering. A God who permits atrocities daily to be committed in his name (for this is a masculine god). A God who has left a burning ruin in his wake. Those of us who’ve attended seminary, as Sentilles makes vividly clear, are taught perceptions of the divine that can never be translated into the pulpit. Those of us who go on to graduate school are permitted a rare glimpse behind the veil to see something that it frightens us to contemplate, let alone write or speak about. It is a burden best worn like a hairshirt—beneath other clothes so that people don’t know it’s there. Many of us are then cast into the career outer darkness with nothing but our highly educated, disturbing thoughts for comfort. Sarah Sentilles has given the world a gift with her revealing, sensible, and very human story. Having grown up with the image of God as a father, it was a shock when a seminary professor once revealed to me that God could never really fill that role. Nor, he added, could the church. While it cannot be the same as breaking up with God, the realization that what you were taught as a child was merely a metaphor forces a grand reevaluation of perceptions. My professor was, of course, correct. Carrying around a faulty image of God will lead only to intractable complications further down the road. Although Sentilles started down the path some years later than I did, it seems we have wound up in the same neighborhood. Her book deserves to be read widely, thought over carefully, and pondered for a time. We need to consider: what hath man wrought? It would be difficult to suggest an ancient class of people with greater New Age credibility than the druids. Although I spent three years among the Celts, I claim to have no special knowledge of the druids, and when I saw Peter Berresford Ellis’ book on the subject, I decided to learn more. Not really a straightforward history—not enough of the druidic culture survived in any material form for the writing of such a history—Ellis instead summarizes a complex gallimaufry of evidence and speculations into a reasonable facsimile of who the druids might have been. 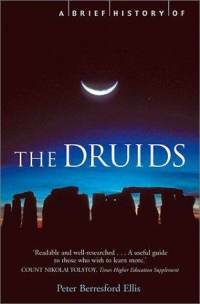 Ellis suggests that the druids were more a caste of society, rather like the Brahmin caste among Vedic culture. Should that seem far-fetched, it would be difficult to read A Brief History of the Druids without noticing the obvious connections between the cultures. The Celts, of which the druids are a subset, have their origins in eastern Europe rather than the usual supposition of a homeland over the sea in Ireland, Scotland, or Wales. Connected to India via a common ancestral language, Indians and Celts both derive from the same Indo-European linguistic family tree. “Do you think yourself Christian if you oppress the poor?… if you enrich yourself by making others poor? If you wring your food from others’ tears? A Christian is [one] who… never allows a poor man to be oppressed when he is by… whose doors are open to all, whose table every poor man knows, whose food is offered to all.” Words a Perry or Bachmann might do well to read. So noble were the druids in the eyes of eighteenth-century antiquarians that many suggested Abraham was the original druid and that the great figures of the Bible were part of the druidic heritage. The world, alas, has gone after Rome instead. Rather than druids we have CEOs and politicians worth a mint before they ever “swear” an oath of office. If the current Celtic revival brings back some powerful druids, perhaps the world might just become a more tolerable place.